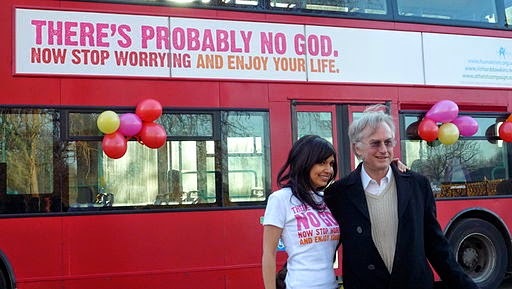 William Lane Craig has repeatedly commented that when very smart people like Lawrence Krauss or Stephen Hawking begin to comment on areas outside their realm of study, such as the philosophy of religion or the existence of God, their opinions hold no more authority than any other layman. In fact, they often get things drastically wrong. A lot of people have taken to critiquing the New Atheists. Some of the most eminent apologists (Craig, Copan, and Lennox among others) have written books cataloging the errors of their screeds. However, the most poignant review of the movement I've seen comes from an older article written by a fellow atheist. Physician Theodore Dalrymple provided this article for the City Journal wherein he examined the posturing and pronouncements of Dennett, Dawkins, Harris and Hitchens. His observations are keenly insightful. The curious thing about these books is that the authors often appear to think that they are saying something new and brave. They imagine themselves to be like the intrepid explorer Sir Richard Burton, who in 1853 disguised himself as a Muslim merchant, went to Mecca, and then wrote a book about his unprecedented feat. The public appears to agree, for the neo-atheist books have sold by the hundred thousand. Yet with the possible exception of Dennett’s, they advance no argument that I, the village atheist, could not have made by the age of 14 (Saint Anselm’s ontological argument for God’s existence gave me the greatest difficulty, but I had taken Hume to heart on the weakness of the argument from design). And Dennett is not alone in this difficulty: Michel Onfray’s Atheist Manifesto, so rich in errors and inexactitudes that it would take a book as long as his to correct them, says on its second page that religion prevents mankind from facing up to "reality in all its naked cruelty." But how can reality have any moral quality without having an immanent or transcendent purpose? Dalrymple notes that Dawkins "quotes with approval a new set of Ten Commandments for atheists, which he obtained from an atheist website, without considering odd the idea that atheists require commandments at all, let alone precisely ten of them; nor does their metaphysical status seem to worry him." Brilliant observation. He also looks at Harris and Hitchens with equal insight. This is the language not of rights and entitlements, but of something much deeper—a universal respect for the condition of being human… No doubt it helps that Hall lived at a time of sonorous prose, prose that merely because of its sonority resonates in our souls; prose of the kind that none of us, because of the time in which we live, could ever equal. But the style applies to the thought as well as the prose; and I prefer Hall’s charity to Harris’s intolerance. The article may be a bit long for some, but it is an excellent read, if for no other reason than to expose you to the writings of Hall! I thank Dr. Dalrymple for his care for the human condition and his honesty and clarity in one more problem with the New Atheist movement—for all their sound and fury, they fail at elevating the human spirit. 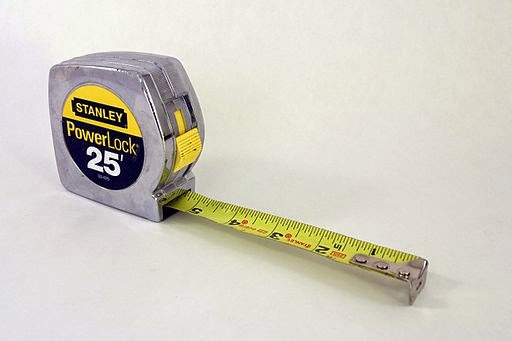 Image courtesy Richard001 and licensed under the Creative Commons Attribution 2.0 Generic license. Are You Guilty of Creation Conflation? One of the primary aspects of God revealing Himself to man is so that man can properly worship Him and begin to understand the glory that is due God. He accomplishes this through two primary means: general revelation in His creation and specific revelation in scripture. Scripture, though, continually points back to God's creation as evidence for why He is worthy of worship, so creation plays a unique role in our understanding of theology. The fact that creation is key to our understanding of God has become increasingly evident in the escalating attacks against the doctrine by skeptics and secularists. Simply put, if God exists, then we are obligated to obey Him. 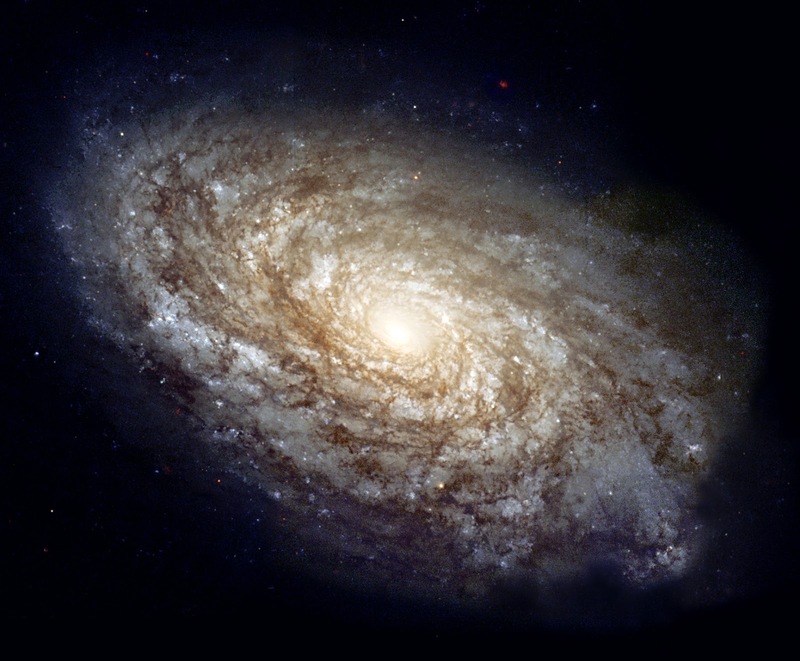 Creation argues for the existence of God (see here); therefore those seeking to be under no obligation to God will seek to undermine the fact of His creation. This should be the point where Christians need to focus their dialogue, since it is the claim most easily demonstrated as false. 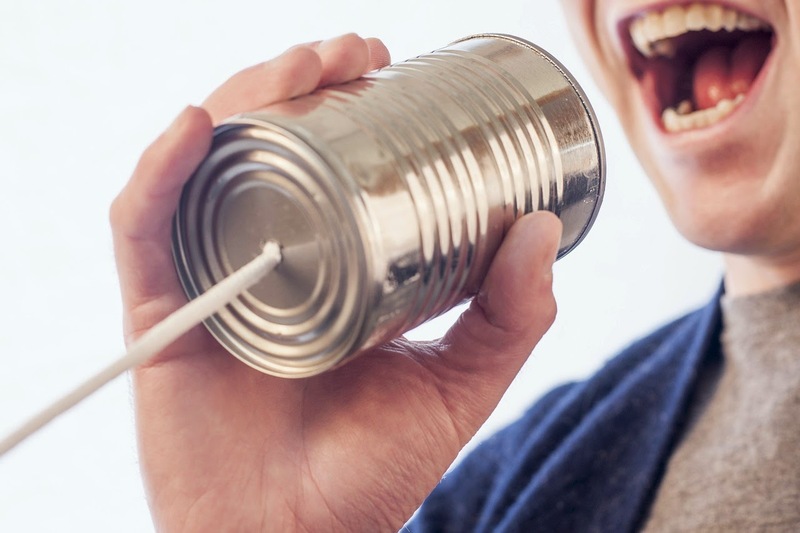 Because the stakes are high, the discussion of these topics can quickly switch from a reasoned attempt to understand the positions to one of pigeon-holing, name-calling and general ill-will. Unfortunately, this even happens between Christian brothers. As James said, we shouldn't seek to quarrel in such a way with our brothers (James 4:1 ff), but we should seek God's wisdom; a wisdom which is "pure, then peaceable, gentle, willing to yield, full of mercy and good fruits, without partiality and without hypocrisy. Now the fruit of righteousness is sown in peace by those who make peace" (James 3:17-18). There are many different ways Christians understand the creation story, but there seems to be a lot of confusion in this area on all sides. People begin to conflate (that is mix up or assume the same meaning) between very distinct aspects of creation. They will assume that if you hold to intelligent design you must believe in a young earth, or if you think that there was a Big Bang you reject the biblical creation account. It is vital in the study of the doctrine of creation to keep this in mind – we need to distinguish between the cause of creation, the method of creation and the timeline of creation. In other words, creation ex nihilo, the Big Bang, the age of the universe and evolution are all different things and believing in one doesn't mean you believe in another. "Why did the Big Bang bang?" "Why are humans fundamentally different from animals?" "Why is it that the laws of the universe just happen to be so delicately balanced for life?" "Where would the information necessary for DNA to work come from?" The diversity of languages may be traced back to just a few common tongues. "When God spoke, did the world just pop into place fully formed or did it coalesce?" "Did God create man uniquely or did He use some natural processes?" How long was Genesis 1:3? "Did God take one hour, ten hours, or many millennia to create all the fish and the fowl?" "What is meant by the word 'day' in Genesis 1?" It is unfortunate that too many times I see Christians make fundamental mistakes in swapping these categories, as though they are the same things. Belief in a Big Bang is not the same thing as a belief in evolution. It is not even the same thing as a belief in an old universe. There may be implications that one belief has upon another, but we need to be more careful in our understanding of each of these categories when we begin to discuss these issues with both fellow believers and with skeptics. It is only the first issue—the cause of creation—that becomes the essential component in the discussion. When discussing God with non-believers, we need to focus our attention on that first. The other two points are important, but they are more "within the family" discussions that can take place in a different setting. This was one of our first stops on the tour. The seaside palace was built by Herod the Great as one of his living quarters. He created an artificial port where ships could dock and take on cargo for Rome and western destinations, and built up an entertainment infrastructure to make it enticing (it isn’t only in modern times that government supports the local sports complex). 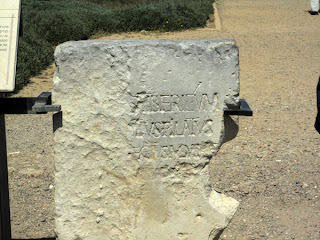 The thing that moved me first, though, is seeing that it was here where the Pilate inscription was found. Until 1961, there had been no archaeological evidence that a Roman procurator named Pilate ever existed. We had the Biblical account and a few second-hand mentions. But, that all changed when this stone slab, which was inscribed with his name, was found here. 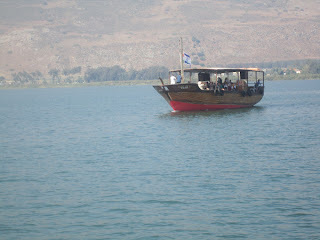 Staying at Tiberius, we awoke on day 2 and jumped on a boat to head out to the Sea of Galilee. This was the first place where we could know that Jesus had been here. On the quiet lake, even with a bunch of other people, it was deeply moving. We went on to Capernaum, Jesus’ base of operations and even saw what is most likely Peter’s house, where he stayed. A great time of reflection. 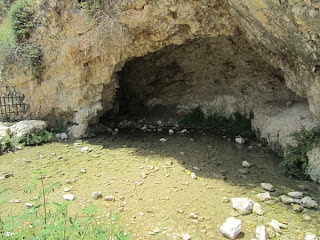 In our trek from the northern region to Jerusalem, we made a pit stop at the spring of Gideon. Talked about in Judges 7, this is the spring where Gideon pared down his fighting force to a mere 300 men. The passage reads "'Every one who laps the water with his tongue, as a dog laps, you shall set by himself. Likewise, every one who kneels down to drink.' And the number of those who lapped, putting their hands to their mouths, was 300 men, but all the rest of the people knelt down to drink water." I had always pictured the spring as having space around all sides, but it actually comes from a northern-facing cliff in the hill. Judges 7:1 says the Midianite’s army was to the north, so if you knelt all the way down and put your mouth to the water, you would basically have your back to the enemy, but if you scooped up the water with your hand, you could keep an eye on the northern hillside and the enemy camp. This incident – one that would have occurred in about the 12th century BC- makes much more sense once you see the actual spring. You get it. You can see that the descriptions in the Bible do not read like the accounts of the gods on Olympus or some such mythology. These are real places and we have real evidence. The inconsequential details, like how people drank, are reinforced by the topography. Even history from over two and a half millennia ago rings true. It is truly an amazing land and was a remarkable trip.